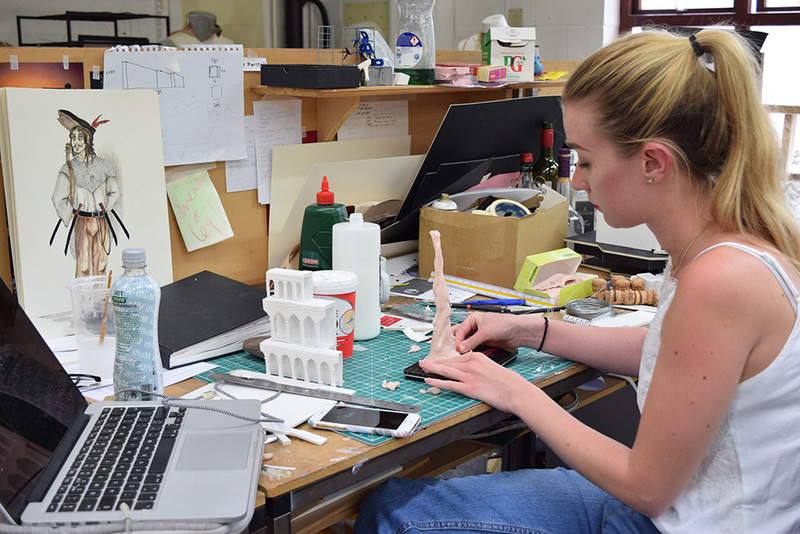 BA Theatre Design student Tara Usher is one of our Student Ambassadors, and has lived in UAL Halls in Tooting for the past three years, whilst studying at Wimbledon. With her final show taking place 14-23 June we interviewed her about her work and her time at Wimbledon. I’ve always been involved in theatre work either performing or working backstage. My granddad would build sets and I would always help out by painting them, I also painted sets when I was doing dance shows. I also come from a fine art background and chose it as a subject at A-level. I completed a Foundation in Rochester, University for the Creative Arts, mainly just to save money and live at home for another year, but also to find out what else I could go into. I am really glad I took a year to do a Foundation Diploma, to see what other pathways there are within art and design, otherwise I might have ended up as a fine art painter. That’s how I got into it, combining art and performing into one thing. When I was in my foundation they pretty much said to us if you are doing costume or set design, unless you go to Wimbledon, don’t bother. I came to an open day, an applicant day and the tours of the halls. I remember I had the Student Marketing Manager, Naomi taking me round and I was really embarrassed because I asked if she was a student and she was like, “No I am not a student, I work here”. All day I had been asking her questions as if she were a student! I really liked it and when I left I thought there is no chance of me getting in. I was really excited when I got an interview. I’ve been working a lot in open-air theatre, my whole third year has pretty much revolved around that. It started last year when I worked with a set designer called Jill Wilson, she does most of the open-air theatre touring for the UK. I started making some sets with her and doing some painting. From that she asked me to do some costume designs for a tour that was going to Dubai. I carried on doing more projects with her, more set build and painting. Jill asked me if I wanted to design for the Minack Theatre in Cornwall, she is now getting to the point in her career where she doesn’t want to do everything, she has too much on her plate and doesn’t want to take it all on so Jill has started to hand those jobs down to me. From that I knew I was going to be designing for the Minack Theatre, this made me look into open-air theatre and what that means for my design, what problems am I going to have to deal with. When we had to decide what out dissertation would be it seemed quite natural to me to look into open-air theatre and the experience of open-air theatre on its own. No matter what shows are on people would go for the open-air experience. We have been in meetings about the Minack all year, I have been working doing small scale theatre where I live and a lot of my stuff is becoming musical based, like ‘Les Mis’ and ‘Oliver Twist’. I’ve told anyone that works with me that I am not doing anymore wooden slats because that’s what everyone has wanted. It did work really well for the open-air stuff because it has been solid for when it gets windy. My third year project is ‘Bregenz’, which is an open-air theatre on a lake in Austria. I have been using all my research I have done throughout the year in my dissertation, which has informed my final degree project as well, it is all linked. The Bregenz open-air speculative piece is part of Bregenz open-air opera festival. They have done ‘West Side Story’ once, but it is normally all opera, so I wanted to challenge myself as I have never worked on opera. I started to go and see lots of opera, do lots of research, finding out what works for opera, what I personally find really interesting about opera and what I find boring in opera. I went to a talk at the V&A about trying to get young audiences interested in opera and how we can do that. One thing that came up a lot in the talks is this idea of making it large scale, making a large visual spectacle as well as a musical spectacle which is what draws a lot of audiences in. I have tried to play with scale, play with the idea of it being a spectacle looking at a lot of Salvador Dali’s work as well as Leonardo Da Vinci, using influences from them. During all this research I found the opera, ‘La Giaconda’, which is the opera I am designing as my final piece. It is based in Venice, the lake at Bregenz ties in quite nicely, having water from the lake around the set. I want to be able to use the surroundings and incorporate them into the design, not just plonk it all in the middle of a lake. Also ‘La Giaconda’ is the Italian name for the ‘Mona Lisa’, so that ties in quite nicely with my Leonardo Da Vinci references. I’m also playing about with the vulnerability of the human scale. Setting part of the stage in a realistic human scale and then contrasting that with something big scale, which is really strange to enhance that sense of large scale spectacle verses the human scale at the bottom of the stage. One of my tutors, Matt Dealy, has been really helpful, fortunately for me Matt has worked on Bregenz in real life. 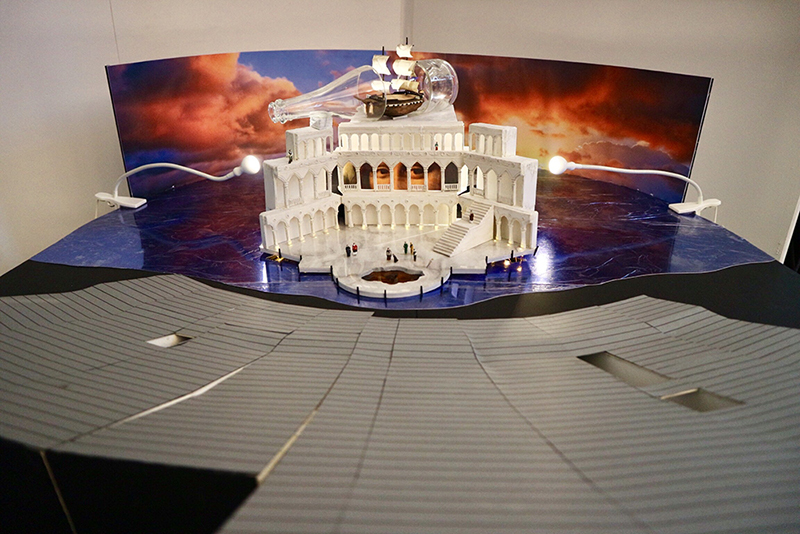 I think he worked on the model box for Es Devlin’s ‘Carmen’, this meant he could give me a lot of first had advise. I have had a lot of issues trying to plaster cast my arches, Graham in the plaster and cast workshop has been an angel with that. We spent six hours in the workshop trying to work out how to do it without it crumbling because it was so tiny. I think that challenged him a little bit, but it was really interesting to see how all the different materials reacted and I will keep that in my memory bank for the future. This year some of us worked on the New Directions project, it was the first time we have realised a project. I had a bit of a stressful project, because I only received my script on the Monday of the build week, at the time I hated it because nothing was working and I didn’t know how I was supposed to come up with a design if I didn’t have the script to work from. I had to design something that hopefully would work and order everything, then when I got my script I had to change my plans and I last minute sourced my cages from the back of the canteen. I was really proud of the final product and the amount of energy we all brought together really changed the situation into a positive and successful outcome. Having gone through a tough challenge I did learn a lot and that is why it is probably one of my favourites. I have bits and bobs jobs really. For about two years I have worked with a production house company called Boo Productions in South Wimbledon. They make sets and events for parties so they are always my back up. This morning I received an email from the director I worked with on our New Directions project and she brought in a writer called Tristen, he did all our script for us. We are now putting that into a research and development process, trying to push that a bit further. At the same time, I think in October and November he is also working on another show which they are putting in funding for and he has asked me to design it. I am always doing shows for my local theatre company which I’ve worked with for years, working on all their musicals. 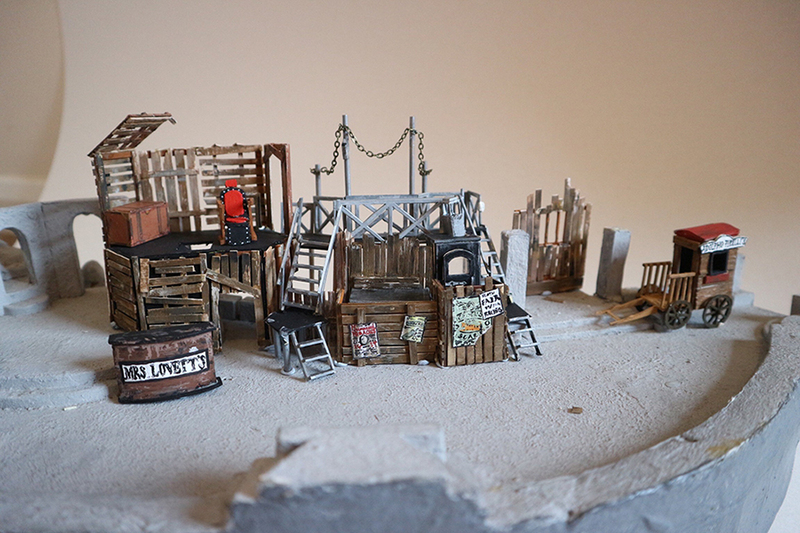 I always get a team of my friends to come in to the workshops and build the sets. Finally, do you have any advice for future students considering your course? Spend as much time in the studio as you can, like model making techniques that you can share with each other, I wouldn’t know that skill if I would have just worked from home. You can see the pace everyone is working at and keep up with. The tutors are always walking around so you can always get some extra tutor time and advise with your model boxes. See Tara’s work at the Wimbledon Summer Show 14-23 June and on her Instagram.